From Maine to Kentucky: Six Years of Blogging! This is blog post 392 over the past six years. Although I have slowed down, I hope to continue with at least two to four posts a month. As I recently noted in a comment on another geneablogger's post about the slowing down of genealogy blogging (see Julie's Genealogy and History Hub), it was easier to blog when I started this blog - sharing census records and some of the many photographs was relatively easy and fun. Now that I spend my genealogy time exploring my DNA matches and trying to contact them, I don't manage to find as much time to write blog posts, unless I get really excited about a new discovery. From July 2016: Dad's Pet Goat - This is now the fifth top-viewed post of all time on this blog. From September 2016: David Freeland - 4th Great-Grandfather - I confirmed his burial location this year, as well as expanded the branch of his family tree with more descendants! A follow-up to my November 2016 post about the Short Snorter with my Dad's signature - one of my brothers purchased it to give to another brother so it is now in the family! From December 2016: DNA ~ Visual Phasing is one of my favorites of the year (for the DNA geneageeks in my audience). I have almost completed this project for all the chromosomes for me and my two brothers. I hope that known family members who have tested at AncestryDNA will upload their DNA to FamilyTreeDNA or GEDmatch which both have chromosome browsers. This will help me to fully complete this project and help me figure out how I am related to the genetic matches who contact me. From March 2017: I Found My Great-Grandfather on DeadFred! Looking ahead, I have taken advantage of the DNA sales going on right now and have purchased DNA tests for my sons. (Son #1 actually asked about it!) With three of their four grandparents having tested, it will be interesting to see how much DNA they share with each grandparent and with their uncles! Thank you for continuing to read my blog and I hope to keep sharing family photos, family finds, and educational DNA posts. Elizabeth, Congratulations on your 6th blogiversary. 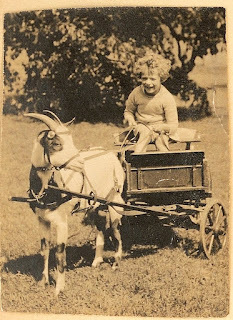 I enjoy your stories - I loved the goat story - and I love the Maine to Kentucky connection. Linda, one of these days we'll figure out how we're related whether through a Maine ancestor or a Kentucky ancestor. Thanks for the comment! 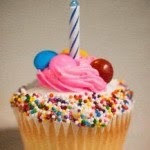 Happy Blogiversary to you! I particularly remember your Short Snorter post, which was fascinating. Looking forward to seeing you at NERGC next week. Marian, I look forward to finally meeting in person next week. Thanks for being such a faithful reader! Dana, thanks for reading and commenting! Jana, thanks for reading and commenting! Happy anniversary, indeed! A job so well done, too! Now to figure out what you mean by "share my Ancestry DNA!" Ha! I am so new at this! Enjoy the conference! Tee hee - you knew I was "speaking" to you, though there are other relatives, too... Do feel free to contact me if you have ANY questions. Thanks for reading and commenting!